This question comes to mind because of the growing size and popularity of this special and somewhat quirky community. A few weeks ago, David Lauderdale, an editor and writer for the Island Packet, reviewed this question in an article he wrote. I loved the article and wanted to share some things with you. 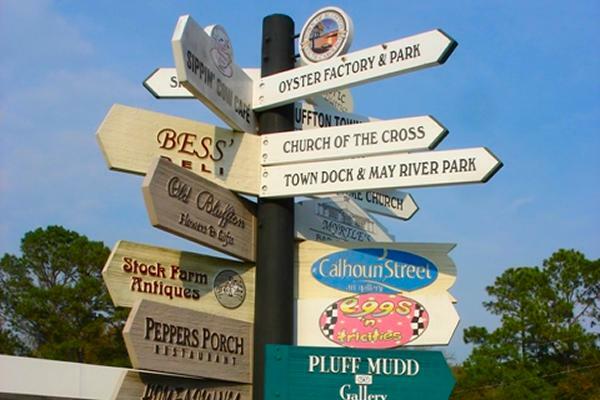 He begins by telling us that the soul of Bluffton is old – in fact, very old. It is as old as the May River because the river has always been the soul of Bluffton. David interviewed Emmet McCracken, who is from a family that has lived in Bluffton for generations. Emmet and his wife live in the family residence on the May River. My husband, Bob and I have fond memories of visiting there. We bought antiques from his parents in 1979 after we purchased our first villa on the island. We loved going there to see the majestic views. It was fun to visit with Emmet’s parents, who always shared some local lore with us, and they were a great source of unique furnishings. One of Emmet’s tales is that his grandfather filled a mason jar with May River water whenever he left town. Each day he was away, he would sponge some of the water on his eyes at dawn. While Emmet admits that this treatment has not been scientifically proven to have value, it does say something about his grandfather’s having a strong tie to home and his beloved river. Bluffton has grown from numbers in the hundreds to 20,000 in a generation, but the small town feel and neighbors looking after neighbors remains unchanged. Plan your visit to coincide with one of the many festivals held throughout the year or one of the town’s summer sunset parties. Enjoy some local music, eat some southern cuisine, drink some craft beer, and party on the river – in no time, you will have picked up a slight drawl and be drawn into the community. Somehow it just feels right!